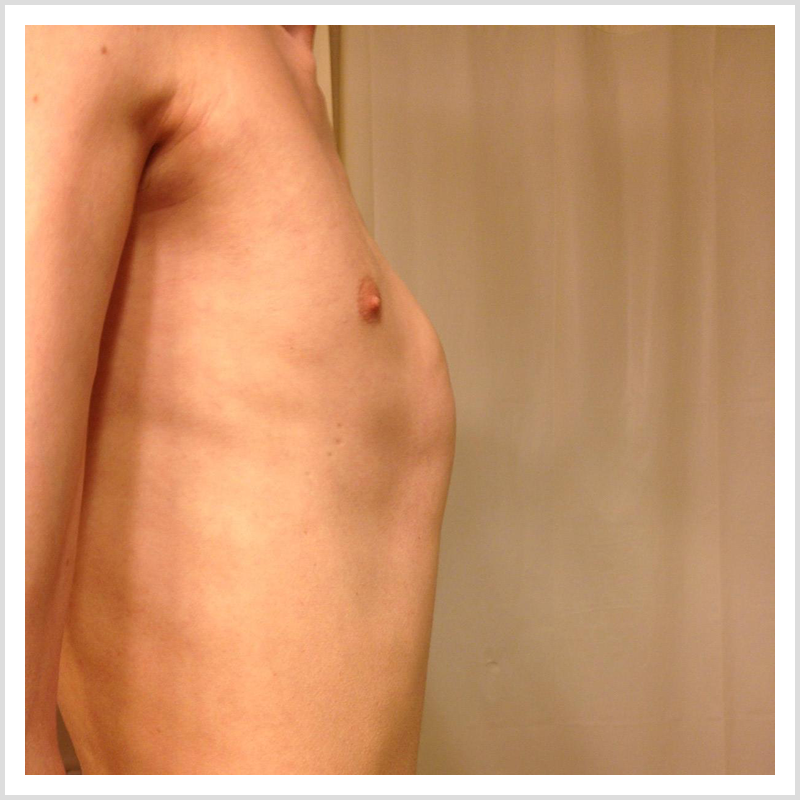 Pectus Excavatum, also called funnel chest, develops because of a growth disorder in the rib cartilage next to the sternal bone. Due to an accelerated growth the sternal bone is displaced backwards. This growth occurs especially during the growth spurt of puberty, and this is why we see a progression of the funnel chest during this period. The exact cause of this accelerated growth is unknown, but it can be caused by the use of certain medicines, pulmonary disorders or previous surgery on the chest wall. Genetics play a role in 25-30% of cases. More people in the same family can be affected. Most cases of funnel chest are isolated but it may occur with scoliosis, cardiac anomalies and other syndromes or fibrous tissue disorders (Marfans disease). One of the most important reasons to treat a funnel chest is the cosmetic aspect and the possible psychosocial impact during puberty. One could be ashamed for the deviant shape of the chest wall, and children are sometimes bullied by peers. A funnel chest may lead to physical complaints such as pain, dyspnoea, fatigue and exercise intolerance. What kind of complaints do you have? Are you the only one in your family with a funnel chest? After that the doctor will examine your chest wall. Depending on the shape of your chest wall your physique and other information on chest wall deformities or other anomalies in your family, the doctor could decide to perform some additional examinations for example: an ultrasound of your heart, a CT or MRI scan. It could also be necessary to consult a cardiologist, orthopaedic surgeon or see a clinical geneticist. Treatment of the pectus excavatum is done by surgery (Nuss procedure) or in a non-operative way with the vacuum bell.During a Nuss procedure the surgeon inserts a long, stainless-steel bar that is bent to the desired shape of the chest. The bar runs under the sternal bone in front of the heart. As the bar pushes the sternal bone forwards, it reshapes the cartilage that holds the sternal bone to the ribs. The goal is for the bone and cartilage to stay in this new, and normal position. The bar stays in for 2.5-3 years and is then taken out. In some cases, when the funnel chest is minimal and children are very motivated or when a Nuss operation is dangerous, the vacuum bell treatment might be a good alternative. During this treatment you have to regularly use a vacuum bell at home that forces your sternal bone forwards during treatment. This vacuum treatment takes longer and its long term effects/results are still being investigated. What treatment suits you best depends on different factors: the severity and rigidity (stiffness) of your funnel chest, previous surgery, motivation, et cetera. The doctor will discuss the best options for you after his examination. More information on the mentioned treatment can be found elsewhere on this site.